Looking for the perfect gemstone engagement rings to sweep your significant other off her feet? Don’t stress too much over it, because we’re here to help you pick the perfect gemstone engagement ring. The tradition of wearing the ultimate symbol of commitment takes us back to ancient Egypt. Egyptians wore these rings on the third finger of the left hand. Why that particular finger? That’s where the “vein of love” is believed to be located. This particular vein goes straight to the heart. The lovely tradition continues to this day in most parts of the globe. Getting engaged is one of the most exhilarating moments in a couple’s life. With your engagement ring, you pledge full commitment to your better half. You start your own family tradition, and this is why you can’t be too picky when it comes to such an important symbol of love. Always look for the finest gemstones on the most precious metals for that once-in-a-lifetime investment. Gemstone engagement rings are an alternative to the classic diamond engagement rings we see everywhere. Diamonds aren’t every girl’s best friend, you know. Choose to be unique and surprise your fiancée with a colorful engagement ring that will make her stand out from all the others. What are the perfect adornments for gemstone engagement rings? Morganite is a romantic and feminine stone. It’s one of the best choices you could make in choosing the gemstone for the ring. Its color can range from pale pink to violet, peach or salmon. This pink stone of love is believed to carry an energy that warms the soul of the wearer. It’s used to open the heart chakra, and it can also cleanse the body of anxiety and stress. The gemstone is often cut into rounds ovals, pearls, hearts, and cushions. You can pretty much get Morganite in any shape you desire, and it will inspire the same tenderness nonetheless. Opals make for the most unique and classical clusters. If you’re looking for vintage gemstone engagement rings, you should definitely turn to Opal. It’s antique-look makes it perfect for any woman with an incredibly sensible soul. This gemstone can be colorless, white, purple, blue, yellow, orange, red, green, gray, brown, or black. 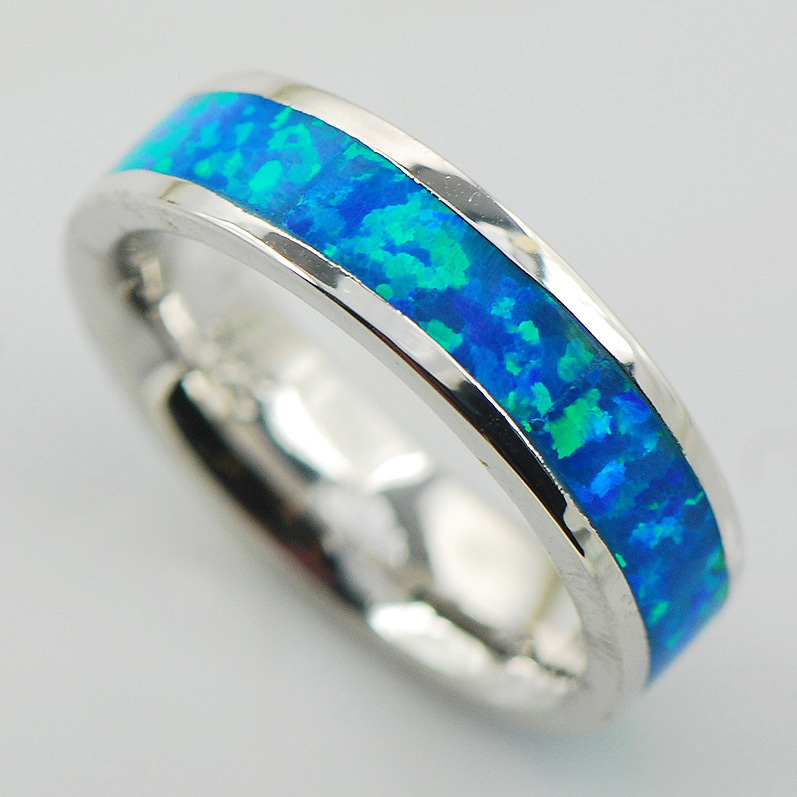 These are the base color of opal, but they can also occur multicolored. Certain stones display different colors depending on the angle of viewing or light source. Just as it absorbs and reflects light, Opal picks up feelings, desires, and thoughts, amplifies them and returns them to the source. Oh, Ruby, the passion stone. If you’re looking for gemstone engagement rings fit for a red-blooded woman, you’ve found it. Put Ruby on any precious metal ring, and it will make it look rich and luxurious. It comes as no surprise, as Ruby is considered to be the most magnificent of all gems. Ancients believed that its value even exceeded that of the Diamond. It’s a talisman of passion and prosperity, symbolizing the sun and its glowing hue. Ruby’s color ranges from bright red to dark reddish-brown. The most popular color is deep blood red, which your fiancée will surely be crazy about. This gemstone is highly durable, situating itself just behind the almighty Diamond when it comes to toughness. Without a doubt, the perfect permanent stone for your lasting relationship. Searching for pink gemstone engagement rings? If your significant other loves pale colors, Sunstone just might be the one. This gem comes in many colors, ranging from colorless to pink, yellow, orange, and red. Colors can also vary in a single stone. For example, it might be pink on one side, but turn it around and see how it gradually strengthens to orange. Sunstone is not your usual store-bought gemstone, and this is what makes it unique. It’s popular among innovative jewelry designers who take an interest in out-of-the-ordinary materials. And if you aren’t convinced just yet, you should know that it fits almost any budget. If you’re tight on money but still want to make the perfect delicate gift, look no further. Returning to more colored gemstone engagement rings, let’s have a look at the dazzling Topaz. It comes in white, blue, red, green, yellow, orange, brown, pink, gray, purple, and multicolored. The most popular has to be the blue Topaz. This gemstone carries us to the vast calm sea, as it instills a sense of tranquility. It is said that Topaz is the crystal of truth, friendship, and hope. Its healing abilities are connected to both spiritual and physical rejuvenation. It releases feelings of joy and happiness, making your engagement day even more special. It’s a durable stone, fit to adorn gemstone engagement rings that symbolize long-lasting relationships. Emerald gemstone engagement rings shine through their particular green colors. It’s these rich green tones that make it a favorite among jewelry designers. And among lovers. Emerald is a stone of love and lasting romance. It’s reputed to bring passion and domestic bliss into relationships. In ancient Rome, the color green was associated with Venus, the goddess of love and beauty. The Incas and the Aztecs regarded Emerald as a holy gemstone. Today, this color still holds a special position in most cultures and religions, and the stone itself is considered one of the most precious of gemstones. Place it on a ring, and this durable stone will give it that antique look that’s so fashionable right now. Where to Find Unique Gemstone Engagement Rings? The vast Web is your friend when you don’t have time or patience to move around in search of the perfect engagement ring. You can find something to fit your budget, as online stores offer cheap gemstone engagement rings, along with pricier ones. Some shops will actually let you design your own gemstone engagement ring, which will add to the uniqueness of it. This UK-based shop is quite the treasure chest. It offers a large selection of engagement rings, and it’s nearly impossible not to find something you like. Check out the gemstones engagement rings that differ in models, size, stone, and price. Feast your eyes on rings made of Ruby, Pink Sapphire, Emerald, Tanzanite, Aquamarine, Blue Topaz, Amethyst, and more. Each stone comes in a multitude of designs that satisfy any customer. The Diamond Store ships worldwide, and you can get the ring delivered to your door as soon as one to two days. Gemvara offers a large variety of engagement rings for the pickiest of grooms. You can even design custom gemstone engagement rings if you have a certain design in mind. Their website is filled with wonderful rings crafted by talented jewelry designers who do an amazing job at creating complex models. The standard shipping is free to the US, and you get 101-day money-back returns as well as take advantage of one free ring resizing in the first 101 days. Overstock delivers expensive-looking gemstone engagement rings at an affordable price. Sapphire, Morganite, Opal, Emerald, Ruby, are just some of the many gems available on this online shop. For a more efficient browsing, you can narrow results depending on the stones’ cut, metals used for the bodies of the ring, stone color, ring style, price, and more. Overstock offers free standard shipping to the US, while also being available to international customers. Hey Buddy!, I found this information for you: "Gemstone Engagement Rings – Choose to Be Unique". Here is the website link: https://accessgems.com/gemstone-engagement-rings/. Thank you.